In the gloom of the ship’s oil lights, Ernest saw that the blizzard had broken up the ice plain. Huge, jagged ice slabs jutted into the air around the Endurance, jostling and scraping together. Great drifts of windblown snow had piled up behind them. Alone in the polar darkness, on a ship coated and locked in ice, the explorers waited. 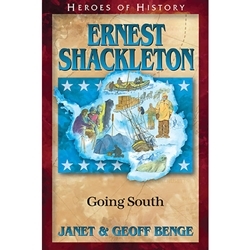 As adventurers from around the world raced to reach the South Pole and achieve other polar firsts in the early 1900s, outsider Ernest Shackleton and his motley expeditions would outshine even the British navy, becoming icons of the Heroic Age of Antarctic Exploration. Known for prizing loyalty, leadership, and skill without regard for rank or social class—and for bringing men back alive—Shackleton completed three death-defying Antarctic journeys. Called the Boss by his crew and Sir Ernest Henry Shackleton by the king, the Anglo-Irish explorer counted it all part of life’s grand adventure (1874–1922).